2.0 mega pixels, 3 x optical zoom, flash, view panel, TV slideshow option, SD card slot, mini-USB jack. Not exactly a breath-taking specification, but this digital camera is 3 years old and still going strong, so its worth a quick review for any of you who might be thinking of picking up a Kodak Easyshare CX4230 Digital Camera. I bought the Kodak Digital Camera new 3 years ago, and its served me and my family well ever since. The only things it really needs is a bigger SD card (I fitted a 64mb one - enough for a couple of hundred pics on the lowest quality setting) and a bag to keep it all nice and safe. 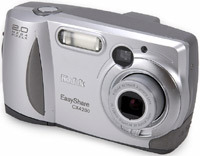 The Easyshare 4230 looks like an old film compact - its very chunky compared to modern digital cameras, but I find this makes it easy to hold. It can work of 2 AAs, I use rechargeable, and keep a few spares in my camera bag. The Kodak has a good lens with a 3x optical zoom, much better than digital zooms which can appear grainy. If you use the view-finder, it itself has its own zoom so that as you use the optical zoom, the viewfinder zooms in too, great for framing your pictures. Because of the 2.0 mega pixel resolution pictures are quite small, between 150k and 400k, depending on the compression level used. At highest setting the Kodak can just about produce images that can be printed out at A4 size. As we tend to look at our pictures on the TV or PC, I always use the lowest setting so I get the most number of images on the SD card. If you get an example with the video lead, you can plug this Digital Camera into your TV and watch a nice slideshow. Kodak bundles their image editing software with the Easyshare, but I tend to use Photoshop elements. The Kodak works best, like most budget digital cameras, quite close to your subject, say within 15 feet. Any further away and the quite wide-angle lens mean you lose detail unless you zoom in. In good daylight condition the Kodak produces colourful lively images. Inside, using the flash, makes ok portraits, but your subjects must stay still. You've also really got to use the optical viewfinder. Using the small digital screen often leads to blurred images. Ok, so does the Kodak make a sensible second-hand purchase? I think so. Its tough. I've dropped mine several times, but its still going strong. It would be nice if it took video, but this is a 3 year old camera. The optical zoom makes this camera stand-out from the super cheap digitals that are available now - an optical zoom is a must have, and makes the camera so much more versatile. You will have to use the optical view finder, like an old film camera, but then it does take nice photos. If you're taking images for display on a computer monitor (or websites) there really is no need for more mega pixels, 2 is more then enough. I wouldn't pay more than £30, but if you can pick one up cheaper, go for it. Use it for yourself or give it to the kids. Hell, if it breaks just buy another! !